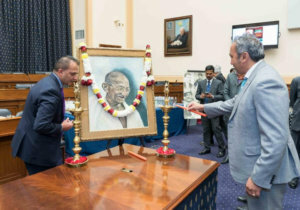 As part of the two-year celebrations marking the 150th birth anniversary of Mahatma Gandhi, the Embassy of India in Washington, D.C., along with several Indian-American community organizations, held an event on Capitol Hill Nov. 27, to celebrate the life and legacy of the Indian leader. 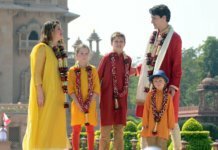 The event was well-attended by U.S. lawmakers, their staff, members of the Indian-American community and the media, according to a press release from the Embassy. 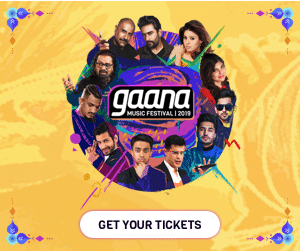 The lighting of ceremonial lamp ‘Diya’ kicked off the event. 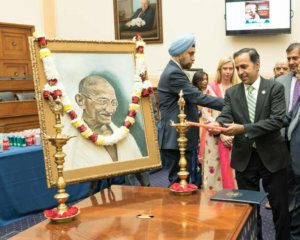 India’s Ambassador Navtej Sarna spoke at the event, as did several members of Congress, including Representatives Ami Bera, D-California; David Schweikert, R-Arizona; Raja Krishnamoorthi, D-Illinois. 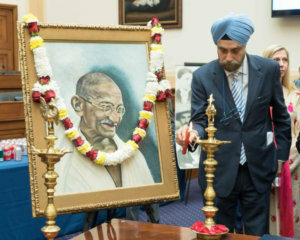 Representatives of the Indian-American community organizations also spoke, including Dr. Bharat Barai, Srimati Karuna from the Gandhi Memorial Center, Amy Hariani of the US-India Business Council, Bhupesh Mehta from the Jain International Trade Organization, Nissim Reuben, assistant director at the American Jewish Committee and Mansi Patel from Indiaspora. 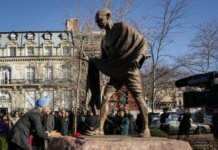 Previous articlePassport Seva Project: The Government of India is streamlining services for Indian citizens living in the U.S.